I have been a pet parent to Chester, a 6 year old hound mix, for 5 years and owned a variety of small pets in the past. We have recently expanded our family by adding a baby girl. I enjoy sharing my pet knowledge and experiences in hopes that others will learn from them. It’s the middle of July, and as we brace ourselves for the next heat wave, I’m thinking of ways to keep my pup cool, too. The evening news features footage of zookeepers serving frozen treats to captive animals – from frozen bananas and fruit juice to whole frozen fish and bloodcicles (awesome if you’re a tiger, I suppose) none of the animals deny a frozen treat for a few minutes of relief from these oppressive temperatures. So, what can we offer our pets at home? Start with a clean container that you can fit into your freezer. You can use anything from ice cube trays to plastic jugs, rubber toys (kongs work great) – muffin tins and popsicle forms also work great. Next formulate your mixture. It can be as simple as natural or low sodium chicken or beef broth, peanut butter & oatmeal, non-fat plain yogurt, lactose-free milk or cottage cheese. Fill the container of your choice. For and extra special treat add some kibble, training treats or even some cooked lean meat. Most dogs have a taste for fruits and veggies, too. Add sliced, chopped or pureed bananas, apples, pumpkin, sweet potato, carrot parsley or pineapple. Pop them into the freezer. Insert a bully stick or jerky strip when the treats are half frozen to make it a true pupsicle. Put back into the freezer until frozen. Serve to your pup! Frozen treats should be served outside to save you the melting mess inside. If creativity and food prep isn’t your thing, we have options for you too. Plain ice cubes or crushed ice can be a refreshing addition to the water bowl. 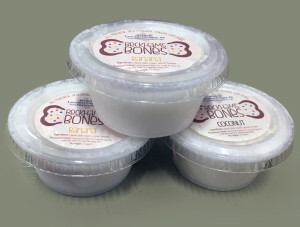 Many companied, like Frosty Paws, are now creating doggie “ice cream” that’s ready to serve in portioned cups. You can often find these or similar products in many pet stores and even in some grocer’s freezers. Next time you sip a shake or smoothie, be sure to have a frosty treat ready for your four pawed friend, too, you may be surprise how much they appreciate it! The July 4th Holiday is upon us, and unfortunately it is one of the busiest times for animal shelters due to the overwhelming amount of dogs lost during the fireworks & festivities. The fireworks may be fun for us, for some of our canine friends it can be downright terrifying. 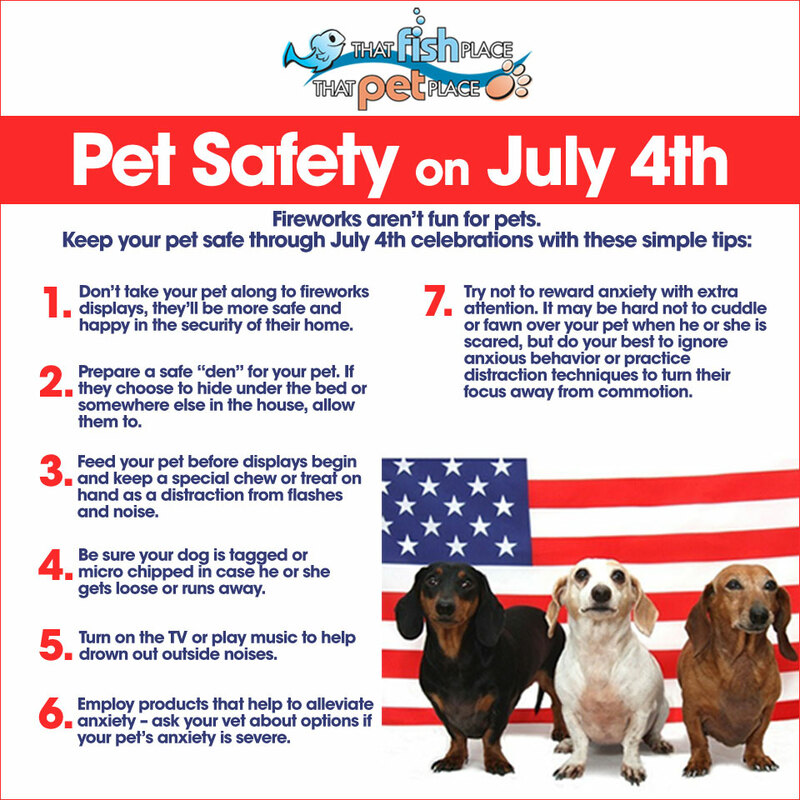 During fireworks displays, or even while setting off fireworks in your backyard and neighborhood, your usually calm family pet may become extremely stressed. The stress overload can cause some pets to try to escape the house or yard. By following a few simple tips for this holiday weekend you can avoid coming home to an empty house and the anxiety of a missing beloved family pet. Avoid bringing your pet to fireworks displays, even if they are not usually startled by loud noises or thunder. Prepare a safe “den” for your pet. If they choose to hide under the bed, in their crate or somewhere else in the house, allow them to. If your dog is not crate trained, and you would like him to be please visit our comprehensive crate training guide. Feed your pet before the displays begin and keep a special chew treat on hand as a distraction. Try a calming aid to help calm anxiety, or ask your vet for medication to help with your pet’s noise phobia. Do not leave your pet outside during the festivities. Even with a fence or a tie-out a dog can go to great lengths to escape the source of their anxiety. Always make sure your pet is wearing a properly fitted dog collar with up-to-date ID tags. Consider having your pet microchipped for extra security. Try not to reward anxiety with extra attention. It may be hard not to cuddle or fawn over your pet when he is scared, but do your best to ignore axious behavior or practice distraction techniques to turn their focus away from commotions. Follow these simple steps to enjoy a worry free Independence Day. The knowledge that your family pets are safe and sound will make your holiday all the more fun. Have a great holiday weekend! Severe Weather can also be very stressful on our pets. Check out this post for tips on keeping you pets calm during severe weather. Looking for a boarding facility in the Lancaster, PA area? We’ve put together a resource of some local options to make your search easier. Please be sure to research if pet boarding is the right solution for you and to tour any facility you are considering boarding your pets in. Please note, That Fish Place – That Pet Place is not affiliated with or endorsing any of these facilities and is not compensated for their inclusion. “At Kieffer’s Kennel Boarding and Grooming, it is our mission to be committed to provide the uppermost excellences in canine services available. “Our climate-controlled cattery and indoor kennels ensures that your pet will be safe and happy regardless of the weather! You don’t ever have to worry about your pet being left outside in the sweltering heat or the bitter cold. Don’t see your favorite Lancaster, PA- area boarding facility on the list? Please let us know in the comments and we’ll add it. Have a great Summer! 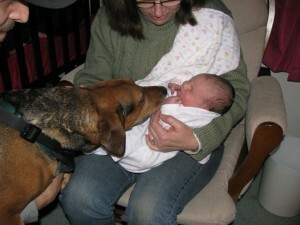 When my husband and I were expecting our first child, part of our preparations included getting Chester (our 6 year old hound dog) ready for the baby. We have all been told to bring something home from the hospital with the baby’s scent on it but did you know there are other ways you can help prepare your dog for their new little brother or sister? Babies come with tons, and I mean TONS, of stuff. You can help your dog prepare by slowly putting the new items out. Set up your crib one day and then that fancy new swing or play mat a few days later. Take it slow and let him get used to each item before adding the next. Introducing these items gradually will give your dog a chance to smell and explore each one, and then when your baby arrives he will already be used to those things being in the house. Have friends with babies? Have them over. If your dog has never been around a baby you may want to see how he reacts to the crying and all the new little movements. Some people have even used those electronic babies you were forced to bring home from health class. Lucky we have lots of family and friends with kids, so Chester has had exposure to children of all ages. Let your dog know what’s okay and what’s not. If he won’t be allowed in the nursery after the baby comes, don’t let him in now. If you let him do things now that you won’t let him do when the baby arrives it’s going to confuse him and he could end up resenting you or your little one. Everyone says that dogs can tell when you are pregnant and I really believe that Chester knew. It might sound silly to a non pet owner, but I talk to Chester like he’s my best friend so naturally I told him all about his little sister before she arrived. I like to think he understood and that helped him prepare. In the weeks after you bring your little one home your front door will be like one of those revolving doors at the mall, people coming in and out all the time. Chester is extremely food motivated, so we stocked up on lots of different types of treats. We got some of his favorite training treats to reward him for good behavior or if we needed to temporarily distract him from the door or other items. We also loaded up on some long lasting treats like Greenies , filled bones, and Indigo chews. These were good to have when he would get a little too excited and we needed to divert his attention for a longer period of time. If you are worried about over treating or your dog is on a diet, toys can also be used to keep your pup occupied. This may be common sense but make sure you have a reliable pet sitter on call. Child birth is unpredictable–you can go into labor at any time and be in the hospital for an undetermined amount of time. Make sure you have one, if not two, pet sitters that will be able to get your dog within a few hours when the big day comes. Chances are that you haven’t seen your dog for a few days, so he is going to be really happy to see you. Give him a little time to get his excitement out and give you all the kisses he wants before bringing in the baby. What worked for us was to have my mom take Emmalynne into her nursery when my husband brought Chester home. Once he was over the excitement of seeing me he sniffed around at the diaper bag and car seat then we took him in to meet his little sister. Your dog can tell if you are nervous and that can make him uneasy, if you stay calm and don’t make a huge deal out of him meeting the little one he won’t either. Remember to take it easy on your pup; this is a huge adjustment for him too. Dog toys and baby toys are surprisingly similar so you can’t really blame him for chewing on one you leave out. Make sure your dog gets enough exercise and attention. Try to stick with his normally scheduled feedings and walks; you don’t want to have to deal with accidents just because you didn’t have time to let him out. We take Chester with us everywhere that we are allowed to. So even though it might be easier to leave him home sometimes, we make sure that if we would have taken him before Emmalynne was born, we take him now. I look at it more like; we now have two kids rather than one kid and a dog. These are some of the things that helped Chester make the transition from only child to older brother. 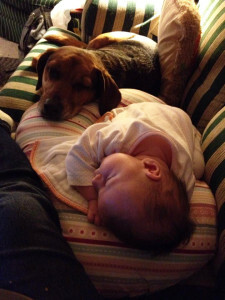 Emmalynne is now two months old and Chester has taken on the role of her protector. When someone new holds her he is watching their every move. He is more alert and curious about abnormal noises. In the mornings when she’s in our room sleeping and I’m getting ready he lays in the doorway where he can keep an eye on both of us. It makes me feel good knowing that he is looking out for her (as all big brothers should). I think he has accepted her as a member of our family and I am excited to see how their relationship grows as she gets older! Should I give a Vitamin B12 supplement to my dog? Rabbits Vs Guinea Pigs: Which is Better For Kids? 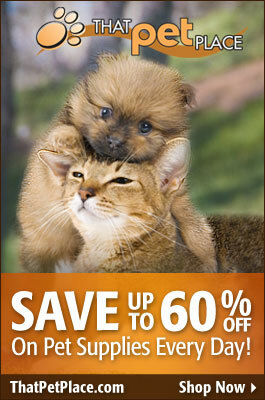 That Pet Blog is designed to help promote knowledge of the pet hobby. If you wish to reference or cite specific information from a blog post, we ask that you provide a link back to the original. The content on That Pet Blog is copyright protected and may not be duplicated without written permission. If you have any questions on this policy, feel free to send us an email at blogs@thatpetplace.com.